Having successfully incorporated the Rubena cycle brand alongside its established motorcycle tyre brands at the start of this year, Bike Tyrestore is taking the European-made Rubena rubber to the UK consumer by exhibiting for the first time at the Cycle Show. You’ll find Rubena in hall 9, on stand M36 and there you will have the opportunity to see its range of MTB, BMX and road tyres. Highlight products at the show will be the marque’s line-up of competition MTB tyres, all designed to excel in differing conditions and most available in tubed and tubeless formats. Among these are the Kratos; suited to rocky conditions, the Charybdis; for muddy terrain, the Scylla; an all rounder and the Zefyros; a tyre for dry ground. Trade only show offers will be available on the stand, so swing by to maximise your margins. Back in Birmingham, Chicken Cyclekit will be touting the Tifosi label’s capabilities within the cycle to work price bracket and its suitability to the Sportiv market. All Chicken brands comprise a broad portfolio of up-market components and accessories, largely sourced from within the EU, many of which are fitted to the bikes on display. The latest Campagnolo EPS electronic 11 speed system – the Athena – makes its debut, with large stocks of Campagnolo’s entire catalogue available to dealers. Up-to-date prices are on the Chicken B2B website and a new complete, hard copy price list is also to be available. Gatorade will continue to broaden its reach within the cycle market, offering visitors to the show the chance to sample product and talk about the benefits of sports nutrition products. 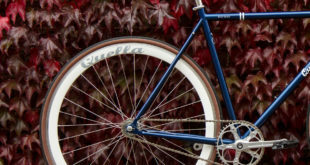 Red Cloud distributed premium bike and component brand, Velocite, will be exhibiting on stand D42. Since launching in the UK at the end of last year, the brand has firmly established itself in the UK market place with a series of excellent press reviews, sponsorship of major race teams and riders – including the Tour Series winning Matrix Fitness Prendas team – winning an iF Design Award for its Helios Aero bike and signing up dealers for its UK retail network. Shown for the first time at last year’s Cycle Show, 4ZA stock is now a big part of Moore Large’s components catalogue, offering three tiers of performance – Stratos, Cirrus and Cirrus Pro – to meet various budgets. The distributor will be showing a good selection of the Italian label’s line at the show and has stock of the majority of parts now. New to the Knog range are the Blinder lights, having recently landed in the UK, new for 2013 is the Blinder 1 making its debut at the show. You can also get a peak at the brand new Strongman and Bouncer U Locks. These are Knog’s highest security locks in the range so far. The Strongman features hardened steel housing with a polymer cover and the 13mm steel shackle is overmoulded with UV resistant silicone that won’t mark the bike. Lake’s 2013 range will be shown in the UK for the first time too, with exciting new Road, MTB and Winter models added. Specialist in disability cycling Quest 88 is to feature at the show, running a dedicated ‘inclusive cycling hub’. The Hub brings together manufacturers of inclusive cycling equipment and will be a source of information on how to access and buy the latest products. Quest 88 will also be exhibiting its full range of tricycles, bicycles, tandems, recumbents, race runners and hand cycles. All Quest 88 employees have an in-depth understanding of physiology, position and posture and will be on hand to answer any queries on how to best accommodate a cyclist with a disability. Mission Cycles will also be bringing its range of disability cycle-product to the show.